From author Ian Birdwell comes The Changing Arctic, a column focusing on the unique security challenges presented by the increasingly permissive environment in the High North. The Changing Arctic examines legal precedents, rival claimants, and possible resolutions for disputes among the Arctic nations, as well as the economic implications of accessing the region’s plentiful resources. NATO is justifiably focused on dissuading Russian aggression, especially given the Federation’s aggressive actions over the past two years in the region. However, there is growing concern for NATO’s northern flank: the Arctic Ocean and far northern Atlantic. 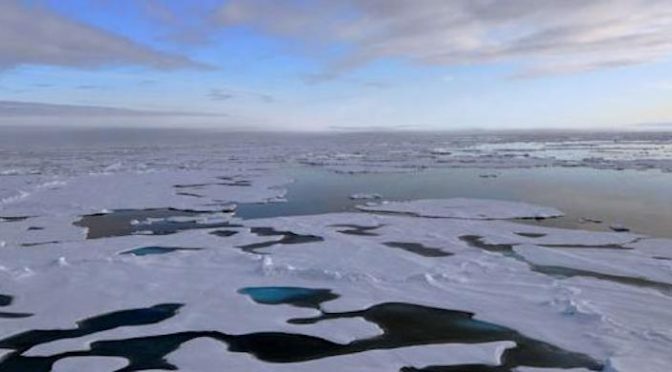 The warming of global temperatures presents new challenges related to rising sea levels to navies like the United States,’1 but the retreat of ice in the Arctic Ocean poses a new risk as an avenue to exploit NATO’s flank in Europe. 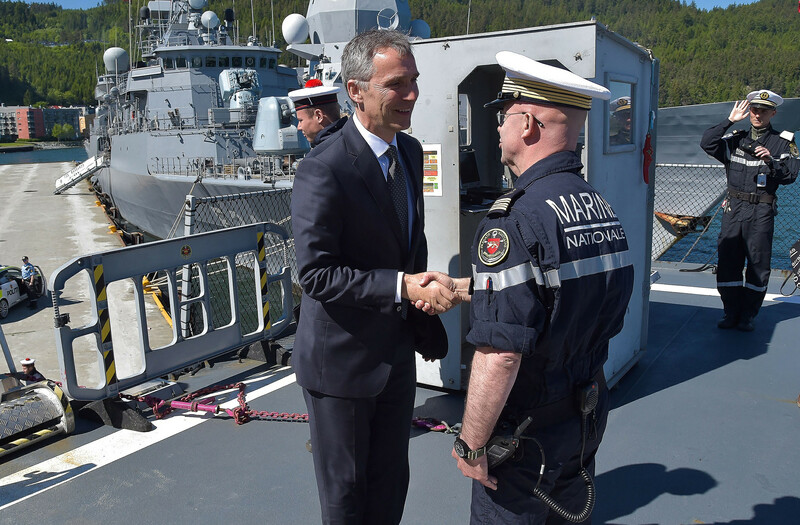 Though some budding conversation determining NATO’s role in defending Arctic nations like Norway from new security challenges is occurring,2 NATO’s gaze remains focused on ground threats throughout Eastern Europe. Despite the persistence of NATO’s strategic goals of deterrence and cooperation, a warmer Arctic demands the attention of NATO powers to preserve regional stability. Looking toward the role NATO could play in maintaining an Arctic balance of power into the future, it is important to acknowledge NATO’s regional hurdles and the strategies the alliance could employ to overcome them. NATO’s goal has always been deterrence through mutual defense and cooperation between member state militaries, but this has never rung quite as clear among its member states as it has since the onset of the ongoing Ukrainian crisis. The crisis, if not instigated by the Russian Federation, certainly advances, exacerbated by the comments of Russian officials and state actions. Since then, Eastern European NATO states have clamored for NATO support in counteracting Russian aggression. Vladimir Putin’s regime regularly draws international ire for their actions moving to exploit Arctic oil resources, the effects those operations may have on surrounding communities, and the measures against those protesting oil exploration.3 For the Russian Federation, the Arctic Ocean represents more than just a birthplace of new oil revenues and potential superpower status, it is one of the only areas of the world were its navy may be able to operate more effectively than NATO. NATO possesses the capability to address and overcome the challenges laid before it. A promising step to move NATO toward readiness for Arctic operations would be to expand the frequency of training activities in the High North. While the norm for nations with Arctic waters like Canada,9 Norway, and the United States,10 the inclusion of non-Arctic NATO powers in a variety of training exercises could prove pivotal in deterring aggression within the Arctic. This past summer, NATO held an anti-submarine warfare exercise called Dynamic Mongoose in the Norwegian Sea that included vessels from eight alliance members.11 With other operations planned for later this year,12 increasing the frequency of such operations, the variety of weather conditions faced, and diversifying into other types of exercises such as amphibious assault drills will allow NATO to become acclimated to regional obstacles and gain the flexibility to respond to threats. The costlier long-term readiness goal involves the expansion of ports close to or within the Arctic Circle to house larger vessels and the construction of new facilities. Accomplishing this task would help close Russia’s geographic and logistical advantages while assisting troops in becoming acclimated to the region’s weather conditions. Moreover, those expanded ports hold the potential to facilitate an increase in commercial traffic, provide a base for scientific research vessels, and contribute to the logistical support of search and rescue operations – all valuable assets for nations wishing to study a changing global climate. For these reasons, the Army Corps of Engineers in the U.S. investigated deepening the Port of Nome.13 Dredging and enlarging ports in the region offer a boon to NATO’s defense goals while boosting Arctic infrastructure for other non-military functions. The last and largest task for NATO powers concerned about Russian Arctic capabilities is providing the funding necessary to meet their NATO obligations. Each NATO nation with Arctic borders proffers in various declarations their preferred method to move forward with Arctic defense is to cooperate with close allies to fill gaps in their defenses.14 If Canada, Denmark, and Norway,15 NATO Arctic powers currently shy of their NATO percentage pledges, increase their military funding closer to the required two percent of national GDP, then it becomes easier for NATO to achieve its overarching security goals within and outside of the Arctic region. NATO transformed from a tool bolstering European Defense in the early days of the Cold War into an alliance pulled in several directions in the name of collective security. Today NATO faces a familiar sight, a Europe pressured by an aggressive Russia. 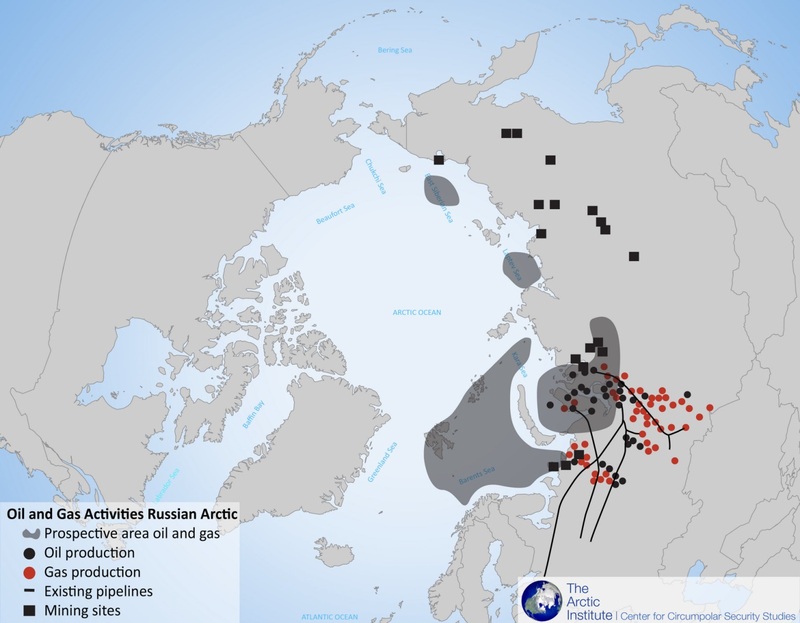 Yet as NATO reinforces its easternmost borders, the Russian Federation focuses on a new, warming frontier that could provide a new threat axis where Russia enjoys preeminence. Ian Birdwell holds a Bachelor’s Degree in Government and International Politics from George Mason University. Since the Alliance Maritime Strategy (AMS) was published in 2011, the strategic context facing NATO has shifted. The drafters envisaged a world where the Alliance would continue to be an expeditionary one, employing its forces in counterterrorism, counterpiracy, and humanitarian roles in many locations around the world. Under the aegis of this strategy, Alliance maritime forces did precisely that. 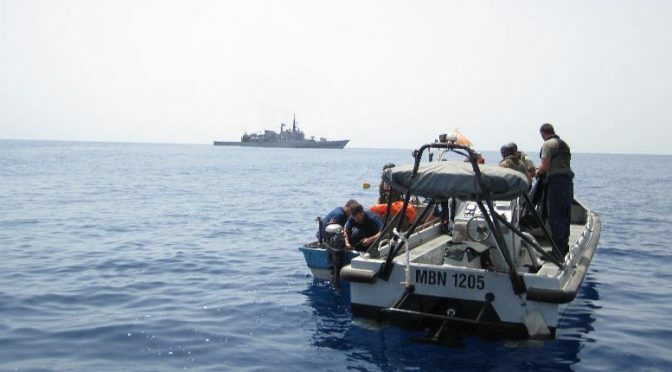 Operations Ocean Shield and Active Endeavor were conducted in these contexts. 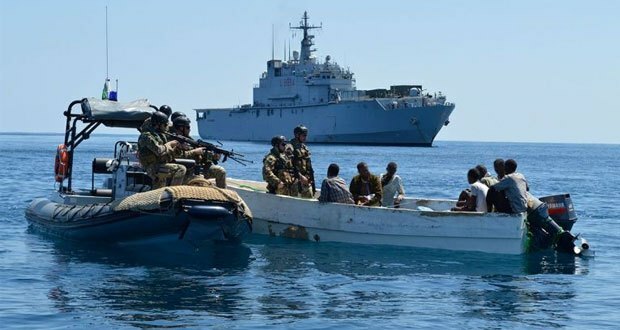 The former was a counterpiracy operation off the Horn of Africa and the latter a counterterrorism operation in the Mediterranean. Both ended in 2016, but Active Endeavor was replaced by Operation Sea Guardian, designed in much the same spirit. Its objectives are very similar: maritime situational awareness, protection of freedom of navigation, maritime interdiction against weapons of mass destruction, counterterrorism, and protection of critical infrastructure. This lone maritime operation does not, however, match the strategic realities that NATO faces. Over the last six years, NATO’s strategic environment has changed significantly. The Arab Spring, beginning in 2011, led to instability on the Alliance’s southern flank, exacerbated perhaps by NATO’s own actions in Libya. One result has been massive cross-Mediterranean migrant flows that European states have been unable to halt. The civil war in Syria has slowly deteriorated to the point that the United States, its allies, and Russia have become involved in the air and on the ground. Naval activity in the Eastern Mediterranean is at levels not seen since the Cold War. Russian, American, and NATO warships continuously ply these seas and the Russian Navy’s only aircraft carrier recently completed its maiden combat deployment from the Eastern Mediterranean. There and elsewhere, Russian forces regularly intercept NATO aircraft and ships in international airspace and waters, generating tension between East and West and demonstrating a renewed level of aggression epitomized by the Russian invasion of Ukraine. In 2014 Russia invaded its neighbor and annexed the Crimean Peninsula and the strategic naval base at Sevastopol in the process. Russia’s actions in Ukraine have destabilized Eastern Europe and the Black Sea region and caused concern amongst NATO and non-NATO states that Russia’s next moves may come in the Baltic. NATO was founded to deter and defend against Soviet aggression in Europe, and Russia’s recent actions have shown its enduring necessity after more than two decades of strategic drift. All told, the strategic environment predicted by the drafters of the AMS has evaporated. NATO has responded to its changing strategic environment almost exclusively through operations and initiatives ashore. To counter Russian aggression and reassure eastern Allies, NATO established two major programs. The first, Enhanced Forward Presence (eFP), installs NATO soldiers in Estonia, Latvia, and Lithuania on a permanent rotational basis. It will be fully established in 2018 and includes troop contributions from 19 member states. The second is Tailored Forward Presence in Romania. This consists of an expanded series of rotational exercises, with the result of near continual NATO presence on Romanian territory. The United States’ own European Reassurance Initiative (ERI), distinct from, but complementary to, NATO actions, is similarly land-focused. Over its three years of existence, from 2015 to today, the annual budget for the U.S. Navy’s participation in ERI has been three percent, four percent, and two and a half percent respectively. The response to Russian aggression has been clearly focused ashore. The existing initiatives are a step in the right direction, but the lack of a coherent maritime response undermines those efforts and presents opportunities for Russia to exploit. NATO’s sole maritime operation, Operation Sea Guardian, does not support existing efforts to counter Russian aggression. And it is not designed to, as it is specifically not an Article 5 operation. Article 5 of the North Atlantic Treaty requires that treaty signatories come to the defense of one another in case of attack and is considered the bedrock of the Alliance. NATO is right to state that Operation Sea Guardian is not in response to an attack on any member, but by explicitly highlighting that the operation is non-Article 5 in focus, it sends a signal that day-to-day operations are not aimed at deterring NATO’s potential opponents. Operation Sea Guardian is also explicitly focused on Task Four of the AMS, consisting of maritime security operations. These are conceptually distinguished from the deterrence and defense roles of the Alliance delineated in Task One. This further demonstrates to Russia that NATO’s maritime focus is separate from its ground efforts. Even if aimed at deterring Russia, it is insufficiently resourced. One recent “Focused Security Patrol” under the mantra of Operation Sea Guardian comprised three aged frigates (Turkish, Greek, and Italian) conducting 600 combined hours of patrols, or 8 and 1/3 days each, in the Eastern Mediterranean. This level of effort, in both duration and capability, is inadequate in the face of the forces the Russian Navy has maintained in that theater. To their credit, Alliance leadership may have begun to recognize the insufficiency of NATO’s maritime posture. As part of Tailored Forward Presence, Alliance defense ministers agreed in February 2017 to increase NATO presence in the Black Sea to improve situational awareness and increase training and exercises. 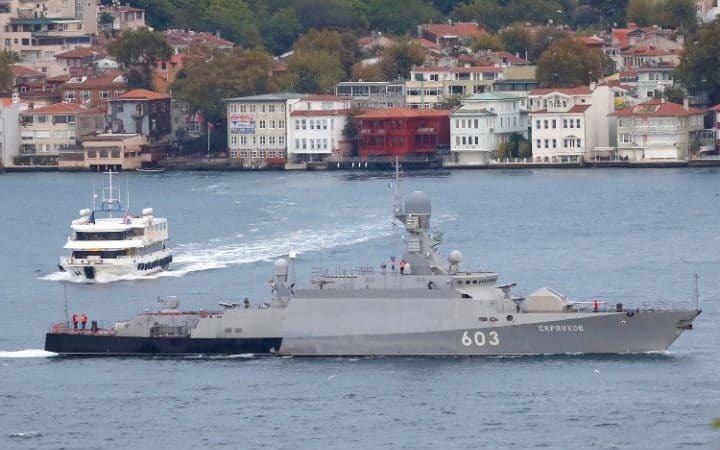 This may improve the situation in the Black Sea, but the problem of deterrence is broader. This ad hoc approach to maritime deterrence will not stop Russia’s pattern of aggressive actions in the seas around Europe. NATO’s poor showing at sea has led some to argue that the AMS itself needs a total overhaul. Critics are correct in noting that the strategy’s discussion of the maritime security environment is out of date. They also rightly criticize the lack of any resource – i.e. force structure and development – discussion. The strategy is also insufficiently focused on the core collective defense and deterrence mission and therefore not aligned with NATO’s 2015 Political Guidance which reemphasized these core Alliance tasks. The AMS does require a refresh, and policymakers should begin discussions on this now, but without delaying maritime action by the Alliance. The AMS itself provides the logical basis for conducting peacetime Article 5 operations. The first task the strategy assigns to maritime forces is deterrence and collective defense. By grouping these two concepts together, the AMS links collective defense and deterrence in a continuum of action between peace and war. It highlights that collective defense is the necessary action in response to failed deterrence. Article 5 requires that member states aid one another only in the event of armed attack, but given the defensive nature of the alliance, the terrible consequences of war between NATO and Russia, and the conceptual link between deterrence and collective defense, it is logical to draw explicit connections between peacetime NATO deterrent operations and Article 5 collective defense actions. Such an explicit connection would improve the deterrent effect of the operation. The AMS notes that deterrence relies upon “proven capability, demonstrations of readiness, and effective strategic communications.” This is firmly based in existing theories of deterrence. An actor, be it a state or group of states, must possess not merely adequate defensive capabilities to either stop enemy aggression or inflict sufficient pain to make the aggression too costly. The actor must also be credibly committed to using this force in the event that deterrence fails. Communicating these two preceding facts to the potential enemy in such a way that their leaders perceive a sufficient threat is the final component. Establishing a new maritime operation would neither change NATO’s capabilities nor fully address the credibility problem inherent in the alliance, but by tying this new operation to Article 5 the alliance would better communicate the seriousness of its commitment to preventing further Russian aggression. As written, the AMS is flexible enough to serve as the basis for a more coherent maritime response to Russia. As it declares, “the relative weight given to the Alliance’s engagement in each of these roles will depend on circumstances and the resources available.” NATO should rebalance its maritime efforts to increase the relative weight devoted to the deterrence and collective defense mission. This can be accomplished through a combination of three actions: launching a new maritime operation with collective defense and deterrence as its main objective, increasing the frequency and complexity of NATO maritime exercises, and better resourcing the existing Standing NATO Maritime Groups (SNMG) and Standing NATO Mine Countermeasure Groups (SNMCMG). First, NATO should establish a new operation focused on deterring Russian aggression at sea and, if necessary, exercising collective defense. This operation should explicitly state that it rests upon the foundation of Article 5 of the North Atlantic Treaty. To date, the article has been activated only once, in response to the terrorist attacks of September 11, 2001. Operation Active Endeavor was established as the maritime component of the NATO response to this armed attack on a member state. While Russia has not attacked any members, this recent experience provides some precedent for establishing a maritime operation founded upon Article 5. To achieve the desired effect, this operation should be wide in its geographic scope and mission to best demonstrate existing capability and readiness. It should be active in the Baltic, Black, Mediterranean, and Norwegian Seas to counter Russian efforts in each of these areas. Russia has increased its maritime presence in each sea to levels last seen during the Cold War and NATO must demonstrate the capability to respond simultaneously in each theater. The operation should also focus on the full-range of maritime missions. It should develop situational awareness of Russian actions, hold Russian maritime forces at risk any time they deploy, and enhance NATO interoperability and build expertise in combined operations at the unit and higher echelon command levels. These actions will better prepare NATO forces to defend against Russian attacks in the event of war and will demonstrate to Russian leaders that NATO stands ready to do so. In addition to a new deterrent operation, NATO should significantly expand the number and scale of its maritime exercises. These exercises should focus on high-end warfighting skills against peer opponents to demonstrate effective combat capability and readiness. Existing maritime exercises are a step in the right direction. The Dynamic-series, consisting of Dynamic Guard, Dynamic Move, Dynamic Mantra, and Dynamic Mongoose in 2017, are focused on air defense and electronic warfare, MCM, and antisubmarine warfare respectively. The current exercise schedule is focused on the appropriate warfare areas but it must be significantly expanded to develop the level of competence and interoperability that would be necessary in the event of war. Antisubmarine warfare exercises in particular require expansion and should be the highest priority. The Russian Navy sees submarines as its primary capital ships, unlike western navies which prioritize aircraft carriers. Russia has invested heavily in its submarine force, with new classes under development, old classes undergoing modernization, and new Kilo-class submarines destined for its Black Sea Fleet under construction. By focusing efforts on detecting and defeating submarines, NATO can demonstrate to Russia that, in the event of war, its primary naval forces will be defeated. Air defense and electronic warfare should also be emphasized. Russia has invested heavily in new antiship missiles. NATO navies must demonstrate their ability to defeat these weapons to show Russia that it cannot count on keeping Allied maritime forces outside striking range of its shore. This will warn Russia’s leaders that they cannot initiate conflicts far from Russian shores and rest assured that the Russian mainland will be safe. Finally, mine countermeasures remains a key enabler for Allied maritime missions and must be strengthened. In particular, the United States should participate in exercises with its own MCM ships to improve its capabilities and highlight the importance of the mission area. Increasing the frequency and complexity of exercises in these three areas would significantly increase alliance capabilities to counter Russian aggression. The final component of an improved NATO maritime posture is better resourcing of the SNMGs and SNMCMGs by member states. Discussions of resourcing in the NATO context are often focused on the two percent policy, wherein member states pledge to contribute two percent of GDP towards defense. Total alliance resources are important, as each state’s total military capabilities are the source of NATO-assigned forces; however, they do not translate directly into forces available for Alliance use. Without increasing their defense budgets, each state could improve NATO’s deterrent posture by assigning more existing forces to NATO missions. A brief review of the maritime forces currently assigned to the Alliance will demonstrate the availability for growth. As currently constituted, NATO’s standing maritime forces consist of two SNMGs and two SNMCMGs. These consist of the three warships and one tanker of SNMG1, ten warships (five of which are small patrol craft) and one oiler of SNMG2, four mine countermeasures (MCM) ships of SNMCMG1, and five further MCM ships of SNMCMG2, for a total of 23 vessels of all types. Looking deeper, one finds no U.S. ships, no French vessels, only one British minesweeper, and only three German ships, one of which is a tanker. The heaviest contributors are the Spanish, Greek, and Turkish navies, who together contribute almost half the ships. Ships rotate through these standing task groups, but the absence of the two largest NATO fleets and the poor showing from the Royal Navy and Bundesmarine indicate a lack of commitment to the Alliance’s maritime posture. If each member state contributed an additional vessel, NATO’s maritime forces would more than double, sending a clear signal to Russia that the Alliance was ready to defend its maritime flanks. Barring that, if the United States, France, and the United Kingdom each contributed several ships it would vastly improve the capability of these forces. These navies are not only the largest, but their ships are the most capable against the threats posed by Russian forces. NATO was founded as a means of defending Western Europe against Soviet aggression, but with the fall of the Soviet Union its raison d’être disappeared and the Alliance lost focus. It grew to incorporate many former foes in Eastern Europe and began participating in peacekeeping and expeditionary operations and envisaged a future where it would emphasize missions other than deterrence and collective defense. Recent Russian actions have reminded Alliance members of its original purpose. Through its invasions of Georgia and Ukraine, its intervention in Syria, and its continued bellicosity at sea and in the air, Russia has proven itself to be a threat to European security once again. NATO has taken actions to deter aggression against its members, but its efforts at sea have been inadequate. Implementing the initiatives above would go a long way toward integrating alliance maritime posture with existing plans ashore, improving the overall deterrent effect. The Alliance has all the necessary tools, its members need only act. Ian Sundstrom is a surface warfare officer in the United States Navy. The views expressed here are his own and do not reflect those of the United States Department of Defense. The governments and peoples of the Baltic States recognize that, following Russia’s takeover of Crimea and intervention in eastern Ukraine, they are once again in the Kremlin’s sights facing the prospect of Russian destabilization and even outright invasion. NATO’s leadership termed Russian strategy “hybrid warfare,” defining it as warfare in which “a wide range of overt and covert military, paramilitary, and civilian measures are employed in a highly integrated design.”1 Questions were raised immediately about the suitability of the designation, as the label NATO adopted fails to adequately capture the reality of what Russia inflicted on Ukraine—and may inflict on states in the Baltic Sea Region (BSR) in the near future. Russia’s desire to probe for Western weakness. Russia is interested less in territory than in effect. NATO’s focus on military measures to defend the Baltic States may overlook the challenge posed by all arms of Russian power to identify and exploit political, social, economic, and military vulnerabilities in its target states and the Western alliance. These dimensions have been underplayed in NATO thinking, a tendency reinforced by the military nature of its Charter and institutional culture. Questions remain as to whether NATO’s own legal framework and traditional instruments are sufficient to deal with these non-military challenges, and certainly whether they can respond to a fast-changing situation. The means Russia is prepared to use in order to deceive and confuse NATO are based on the same tools it used during the Cold War, but it has adapted them to the mores of the social media age, which lacks the experience to judge the import of Russian messaging or actions. Russia’s high-end forces would not constitute the first movers in a hybrid conflict. They should be regarded as deterrents to local resistance and intervention by NATO and other Nordic states. It would rather pursue more ambiguous methods. 2. A more structured, high-tempo campaign to achieve the same objectives against NATO power in the BSR and also render Nordic defense cooperation redundant. It is reasonable to assume that the Baltic Sea Fleet and other organs of Russian maritime power will play supporting rather than leading roles in any such conflict. The Bornholm, Gotland and the Aland group are respectably Danish, Swedish, and Finnish islands that have considerable strategic significance in the BSR. Many are ideal as bases, supply points, staging areas, and jumping off points for SOF operations and ambushes, while bays, fjords, and peninsulas provide hiding places and launch points for fast raiders. When it comes to the Baltic Sea particularly, Poland, Lithuania, and Latvia have only a few nodes that need be severed, while Estonia, the Nordic countries, and Germany have much more redundancy in their connections. Still, the economic disruption caused by severing these undersea cables would be considerable in time and cost and be difficult to mitigate, even for those countries with multiple nodes. They would therefore be a prime target in a hybrid warfare campaign. It has long been recognized that Estonia, Latvia, Lithuania, and Poland depend upon Russian energy. This exposes them to the possibility of economic coercion. These states have reduced their dependence on Russian supplies, but diversification has been difficult given the cost of replacing existing infrastructure and vulnerabilities remain. Ports and ships could be subject to sabotage and strikes using SOF as part of a hybrid offensive. Yet the most serious threat could come from cyberattacks, a concern that already animates much of the landward resilience debate. Modern ports could not operate absent sophisticated computer systems, while modern ships are increasingly automated to cut crew costs. Any prolonged interference with the region’s maritime trade could severely impact industrial production flows and economic security. Why Would Russia Disrupt the BSR? Russia is a revisionist power. Internationally, it wants to revise the existing regional order at the least possible political and military cost to itself, diminish U.S. power, and further a multipolar world. Domestically, Putin’s government requires an enemy to divert attention from internal troubles. The Baltic States lie at the point where American power is most extended and Russian power can be concentrated most easily. As Russia is under no illusion it can fight the U.S. directly, or a coalition of America’s core allies, its challenges will stay below the level of direct confrontation. The Soviet Union invested around fifty percent of its shipbuilding capacity in the St. Petersburg area. A second vital facility is located in the Kaliningrad Oblast. The Baltic Sea has also become a vital conduit for Russian trade. Prolonged interruptions in flows of energy and goods would inflict considerable damage on Russia’s poorly diversified economy. During 2015, 52 percent of Russian container traffic passed through St. Petersburg. Europe remains a major customer for Russian crude oil shipped by tanker from ports near St. Petersburg. On the seabed is the Nord Stream gas pipeline. A second pipeline–Nord Stream 2–has been proposed that would double the capacity. This connection reinforces the dependency and mutual interest that already exists between the EU and Russia and risks compromising Western European responses to possible Russian aggression in CEE. The Baltic Sea Region has plentiful points of vulnerability where Russia can test Western resolve. While these are not confined to the Baltic States, the most obvious point of leverage is the Russian minorities who reside in each one with concentrations in port cities and other maritime areas.6 Nor are the Baltics removed from Russia’s deeply ingrained sense of insecurity arising out of its loss of strategic depth. Advancing the Russian right flank to the Baltic Sea would right a perceived wrong, prevent the encirclement of Kaliningrad, the main base of the Russian Baltic Sea Fleet, and provide a platform from where Russia could threaten the entire Baltic Sea littoral. Despite the importance of the Baltic Sea routes, the Russian Baltic Sea Fleet is the weakest of Russia’s four fleets (Baltic, Black Sea, Pacific, and Northern). It continues to have the lowest priority for new units. That does not mean modernization has not taken place. 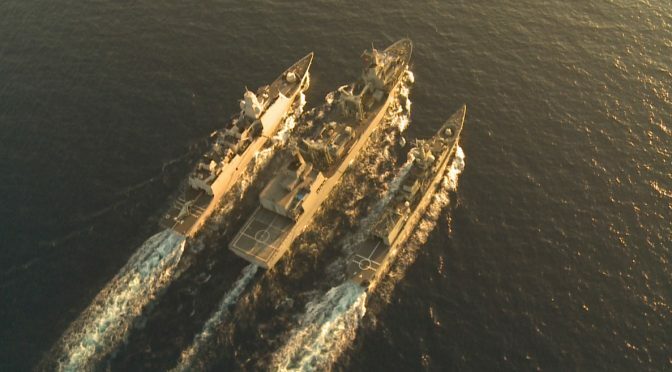 Since 2007, the fleet has been upgraded with two new classes of corvette equipped with land-attack missiles, a capability that is new to the Baltic Sea fleet.10 However, the fleet’s submarines have not been modernized and remain inferior to German and Swedish boats. Lacking AIP propulsion, which Russian industry is having problems mastering, they are also likely to be noisier. The fleet’s anti-submarine warfare (ASW) and mine counter-measures (MCM) capabilities are also limited. That said, the Baltic Sea is relatively small with an average width of only 193km (120 mi). The sea and surrounding littoral can–and almost certainly would–be dominated by air power and air-deployable ground forces in any high intensity conflict. In particular, Russia is able to effectively dominate large areas of the Baltic Sea and air space using missile forces based in the Kaliningrad and Leningrad oblasts.11 The Iskander-M mobile ballistic missile is capable of hitting targets in much of Sweden and from southern Poland to central Finland, whether fixed or mobile. 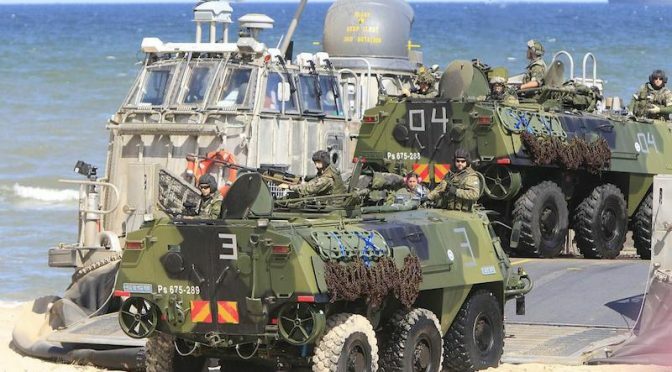 NATO ground forces, meanwhile, would need to travel further than Russian units to reach the capitals of the Baltic states and throughout the transit could be subjected to long-range air and ground-based bombardment. Given the essentially political nature of hybrid war, mitigation measures should focus on political, economic, and information outcomes. Still, Russia needs to be convinced that all BSR states are committed to challenging Russian aggression at sea. The maritime component of NATO’s 2014 Readiness Action Plan includes intensified naval patrols in the Baltic built around the Standing NATO Maritime and Mine Countermeasures Groups, increased sorties by maritime patrol aircraft, and an expansion of the annual BALTOPS naval and amphibious exercise.17 However, BALTOPS in large measure still reflects the Alliance’s focus on high-end military operations. Changes have been made that broaden its focus and these need to be maintained and expanded in order to continuing raising maritime readiness and interoperability standards at all stages along the deterrence-to-conflict continuum. In addition, both Baltic and NATO navies need to exercise lower-end maritime security, VBSS, fishery protection, and SAR missions, while regional navies need to demonstrate they can act seamlessly with regional coast guards and border forces, port authorities and other maritime agencies, police forces and intelligence services. Furthermore, cooperation in intelligence sharing and analysis through a BSR Hybrid Threats Fusion Cell coupled with a strategic communications response capability to provide swift and consistent factual responses to false narratives would contribute to building societal resilience. Societal resilience also requires less dependence on Russian energy supplies. A new facility for the import and regasification of liquefied natural gas (LNG) has been built at Klaipeda in Lithuania. Ensuring its security is vital. Further diversification could be achieved if additional terminals were to be built in Estonia and Latvia with reversible-flow pipelines linking all three. Ideally, a trans-Baltic pipeline should be built to link the Baltic States with the Swedish system.18 These pipelines would supplement the “NordBalt” power cable laid between Sweden and Lithuania. Notably, this link was interfered with by Russian warships on three occasions during the course of its construction. Finally, BSR states need to place a strong emphasis on port and supply chain security. This must include defenses against cyber-attacks. Protecting this largely maritime infrastructure would place a premium on effective Baltic Sea maritime domain awareness (MDA). Russia considers itself to be a maritime power. It has always sought to control the seas that give it access to the world ocean. The Baltic Sea is vital in this regard. Despite this perception, Russian power, when compared to its Soviet predecessor, is sadly diminished. It is therefore understandable that it should continue to augment its remaining military power with the measures of influence, deception, and covert action that were so characteristic of the Soviet approach to inter-state relations. Any repetition of the Crimean model is likely to be a whole-of-government effort of political subversion and destabilization in which the conventional military—as opposed to SOF and proxy militia—will play a largely passive role until the last minute, or unless the political campaign fails and can only be redeemed using conventional military force. Whole-of-government aggression demands a whole-of-government response. In this sense, there is no such thing as maritime hybrid warfare, certainly in Russian political or military doctrine or practice. What states in the BSR may be confronting even now, however, is a long-term campaign of politically motivated societal disruption, aspects of which may occur in, through, or from the maritime domain. The seaborne aspects of the campaign will be maritime rather than exclusively naval in that what takes place could involve any of the ways people use the sea, the seabed, and the airspace over the sea. It will involve warships, submarines, and military aircraft but also include fisheries, shipping and ports, coast guards, and border forces along the way. Conventional naval forces are likely to play an analogous background role in any disruptive campaign at sea in the Baltic, as they did during the Crimea invasion and Ukraine intervention. Martin N. Murphy, PhD is a Visiting Fellow at Corbett Centre for Maritime Studies at King’s College London. He has held similar positions with CSBA and the Atlantic Council in the U.S. He is the author of three books and numerous book chapters and articles on maritime security and unconventional warfare at sea. His next book, On Maritime Power, is due for publication in 2018. Gary Schaub, Jr., PhD, is a Senior Researcher at the Centre for Military Studies, Department of Political Science, University of Copenhagen. Before that he held a number of academic positions in the U.S. including Assistant Professor of Strategy at the U.S. Air War College. 1. NATO. ‘Wales Summit Declaration’. Issued by the Heads of State and Government participating in the meeting of the North Atlantic Council in Wales, 5th September 2014. 2. Kier Giles, et al. ‘The Russian Challenge’, Chatham House Report, June 2015, p. 46. NATO Article 4 states that “The Parties will consult together whenever, in the opinion of any of them, the territorial integrity, political independence or security of any of the Parties is threatened.” NATO, ‘The North Atlantic Treaty’, last updated 21st March 2016. 3. For clear definitions of “hybrid” and “grey-zone” conflicts, and comparisons between the two, see Frank Hoffman. ‘The Evolution of Hybrid Warfare and Key Challenges’. Statement before the House Armed Services Committee, 22nd March 2017. 4. Stephen F. Larrabee, et al. Russia and the West after the Ukrainian Crisis: European Vulnerabilities to Russian Pressures. Santa Monica: RAND, 2017, pp. 10-11. 5. Robert Martinage. “Under the Sea: The Vulnerability of the Commons,” Foreign Affairs, Vol. 94, No. 1, January/February 2015, p. 117. 6. Martin N. Murphy, Frank G. Hoffman and Gary Schaub, Jr. ‘Hybrid Maritime Warfare and the Baltic Sea Region’. Copenhagen: Centre for Military Studies, University of Copenhagen, November 2016, pp. 11-14. 7. Richard Orange. ‘Swedish towns told to “make preparations regarding the threat of war and conflict” with Russia’. Daily Telegraph, 15th December 2016. 8. Daniel Dickson; and Bjorn Rundstrom. ‘Sweden returns draft amid security worries and soldier shortage’. Reuters, 2nd March 2017. 9. Edward Lucas. ‘The Coming Storm: Baltic Sea Security Report’. Washington, DC: Center for European Policy Analysis, June 2015, p. 4. 10. ‘Russia reinforces Baltic Fleet with ships armed with long-range cruise missiles in ‘worrying’ response to Nato build-up’. Daily Telegraph, 26th October 2016. 11. Kaas. ‘Russian Armed Forces in the Baltic Sea Region’. 12. ‘Russia deploys “Bastion” coastal missile complex to the Kaliningrad region’. UAWire, 22nd November 2016. 13. Charles K. Bartles and Roger N. McDermott. ‘Russia’s Military Operation in Crimea: Road-Testing Rapid Reaction Capabilities’. Problems of Post-Communism, Vol. 61, No. 6, November–December 2014, pp. 46–63; Admiral James Stavridis, USN (rtd.). ‘Maritime Hybrid Warfare is Coming’. U.S. Naval Institute Proceedings, Vol. 142, No. 12, December 2016, pp. 30-33. 14. For example, Julian E. Barnes and Gordon Lubold. ‘Russian Warplanes Buzz U.S. Navy Destroyer, Polish Helicopter’. Wall Street Journal, 13th April 2016. 15. Thomas Frear, Łukasz Kulesa and Ian Kearns. ‘Dangerous Brinkmanship: Close Military Encounters between Russia and the West in 2014’. European Leadership Network Policy Brief, November 2014. 16. ‘Russian envoy: Ratification of border treaty with Estonia obstructed by bad relations’. The Baltic Times, 9th July 2016. 17. NATO. ‘NATO’s Readiness Action Plan’. NATO Fact Sheet, May 2015; Megan Eckstein. ‘U.S. Led BALTOPS 2015 begins with heftier presence than last year’s exercise,” USNI News, 5th June 2015; Megan Eckstein.‘Foggo: BALTOPS 2016 includes more anti-sub, more challenging amphibious operations’. USNI News, 15th June 2016. 18. Milda Seputyte. ‘Lithuania grabs LNG in effort to curb Russian dominance’. Bloomberg, 27th October 2014; ‘Sweden gets new LNG terminal’. World Maritime News, 20th October 2014.